Banksy puts one over on the art world again! 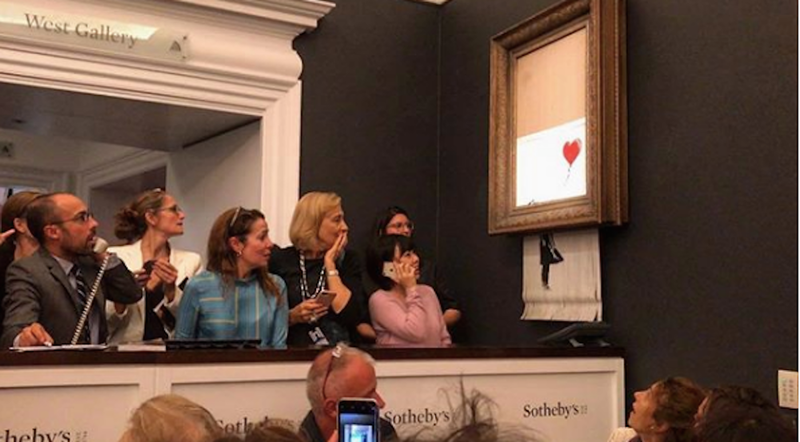 Banksy, the British graffiti artist who has much disdain for the business of art, that is to say, how it is often a commodity that is often highly over valued as collectors try to outdo each other by spending millions of dollars on art pieces in the hopes that they will increase ever more in value. He has eschewed the auction scene because he simply does not accept its premise. So, when his "Girl with Umbrella" came onto auction at Sotheby's in London where it fetched a pricey $1.4 million dollars, as soon as the gavel came down, he had booby-trapped his work to self-destruct by going through a shredder. The astonishment the faces of on-lookers is priceless. It looks like the shredding process was stopped midway - who knows, it might make the painting even more valuable in today's inflated art market. There are theories about why he did it, but regardless of why, the impact of his actions speaks volumes. Who was in on the stunt? Click here to read more.